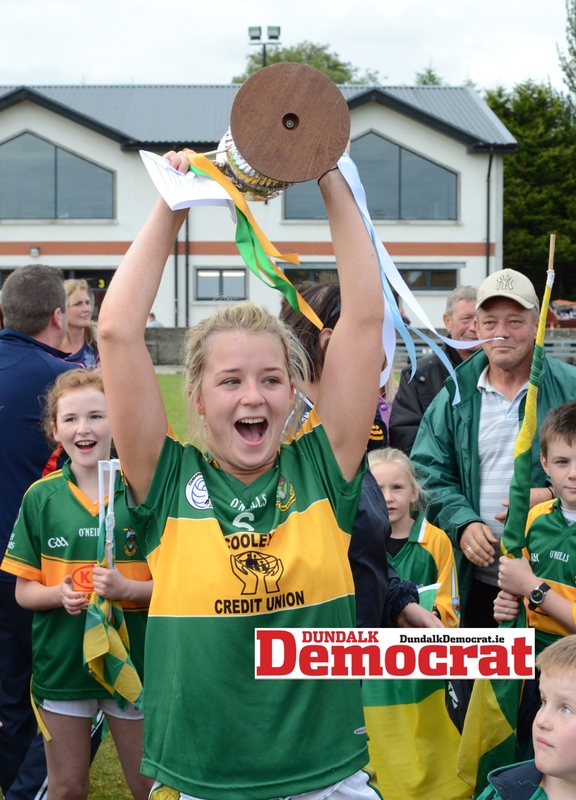 Patsi Boland is determined to respect Cooley Kickhams’ rich championship winning tradition by inspiring her team to success in Friday night’s senior final against Geraldines. The midfielder, who tasted the ultimate success in 2007 and as captain five years ago, remains a driving force behind the peninsula team’s charge, motivated by returning the club to their glory levels of the past. “The pedigree that we had to follow, the jersey we had to pull on after the mark they left between All-Irelands and so many championships, it was unreal,” Boland said. “For me, striving as a player, you set yourself high standards and it’s good to try and strive towards the legacy that those girls left behind. “I’m still reliving it (2013) every day, I still watch the video. It isn’t until you sit back that you appreciate it because they’re so scarce. Boland has hailed the influence of coach Alan Page this season as Kickhams set-off with the aim of atoning for four semi-final defeats since last reigning supreme. One of those losses came against Geraldines in 2016, a match they are seeking revenge for this time around. And with Page’s ability to ready his troops, Boland, whose brothers, Conor and Aoghain, have played with Cooley in multiple men’s finals, reckons they can finally get their hands on the major silverware. “Alan Page is brilliant, a great mentor. I admired him as a player so to have him on the sideline, that experience and drive that he has for Cooley, has like a domino effect. He has pride in the jersey and it just ripples on us then. “The Mochta’s game, we weren’t really happy with our performance overall, but we have learned a lot from it. It was our fourth semi-final since 2013 so we do have experience and a backbone going into the final; we’re hoping that takes us over the line. Boland’s mother, Geral- dine , is still a constant on the Cooley sideline. Indeed, the pair hold the honour of being the only mother and daughter to captain a team to Louth senior glory. The successful teams which Geraldine was a part of inspired Patsi to come in the next wave. And, now, with another generation of youth budding out Cooley way, Lauren Boyle and Niamh Rice to name just two, Boland is intent on starting the ball rolling on another spell of Kickhams dominance. “You’ve no-one else to look up to anymore. There are younger girls starting off and you kind of have to mould into the leader’s role. We grew up on the sideline playing girls football so it’s a good tradition to keep alive. “I don’t know what it is about the underage in Cooley, the pedigree of them is unbelievable. And Niamh and Lauren, being so young yet so mature on the football pitch, they’re incredible. We have a good balance of young and old and in fairness to the young ones, they stepped up when we needed them. And they will likely have to with Friday’s final almost too close to call.